Map of Washington, Georgetown and Vicinity. 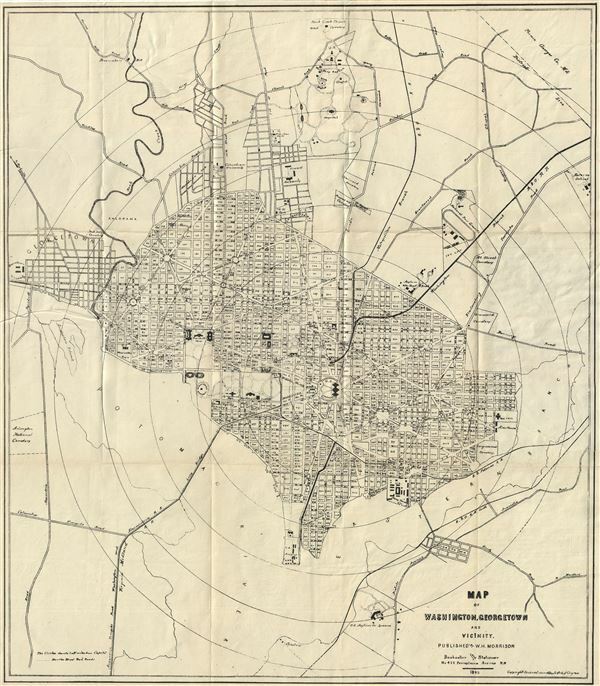 An interesting 1882 map of Washington D.C. issued by the W. H. Morrison. The map covers all of Washington D. C. as well as the surrounding region and was prepared for The Strangers Guide to Washington, Georgetown and Vicinity. This map was clearly reduced from a larger map, most likely a government publication, and consequently, can be difficult to read in places. W. H. Morrison is, in the usual term, a hustler, being his own solicitor. By scouting surrounding towns is a fast building up a good trade. His long experiences in the line and extensive acquaintance give him at once a good position in the trade. -The American Stationer Feb 4, 1892. Morrison printed maps and Guides to Washington D.C. as well acted as a bespoken stationer and a government printer. Among other things, Morrison was a strong advocate of paper currency - no doubt hoping to get an edge on the business of printing money. He maintained a storefront at 475 Pennsylvania Ave, N.W. Morrison, W. H., Stranger's Guide, (Washington D.C.) 1883. Good. Some wear on original fold lines. Archivally backed with Japanese tissue. Bryan, W. B., Bibliography of the District of Columbia (Washington D.C.), p. 121.